In today’s world the chances are quite high that you have seen some example of digital signage. Perhaps at a Quick Service Restaurant where Digital Signage is being used to display the menu, or at the airport where Digital Signage is used to display flight arrivals and departure or for wayfinding purposes. The definition of Digital Signage is displaying content such as digital images, video, streaming media, web pages, weather data, restaurant menu, or text on a Digital Display, such as a TV or computer monitor. The average Digital System has, at a minimum, at least one Display, Commercial Preferred, as well as a Digital Signage player connected to the display. Content is pushed from the Digital Signage server to all attached players, and the Content is then displayed across said network. In this week’s Western Audio Visual blog, we will discuss the 4 main areas where Digital Signage can benefit your business. Sales Promotions – Digital Signage is a great way to promote new products and services. A Quick Service Restaurant, for example, can their menu displayed, as well as allowing for a section to promote a new menu item. It can also be utilized to promote an item that has performed well in the past, but may not be doing as well currently. Digital signage, for the sake of promotions, is much better than a printed ad, as the printed ad stays the same, whereas the Digital Signage ad is much more engaging, as it can continually change. The average consumer of today has a much shorter attention span than that of a consumer from 10 years ago. Digital Signage catches the attention much quicker, as well as holds the attention much longer. Building Brand Loyalty – Digital Signage can be utilized to build Brand Loyalty through the use of content that speaks to the consumer on a personal level in a non-sales way. For example, an athletic shoe brand can have a video of a person running on a path, with a catch phrase or two being used. The average consumer in today’s world is more likely to watch a video than read an ad. Corporate Communications – Digital Signage can be utilized in Corporate Offices to communicate a wide array of messages. Everything from a company event to changes in the company provided health plan can be communicated via a Corporate Digital Signage system. Organizations from Taco Bell Corporate to the Los Angeles Rams employ Digital Signage systems to accomplish these goals. 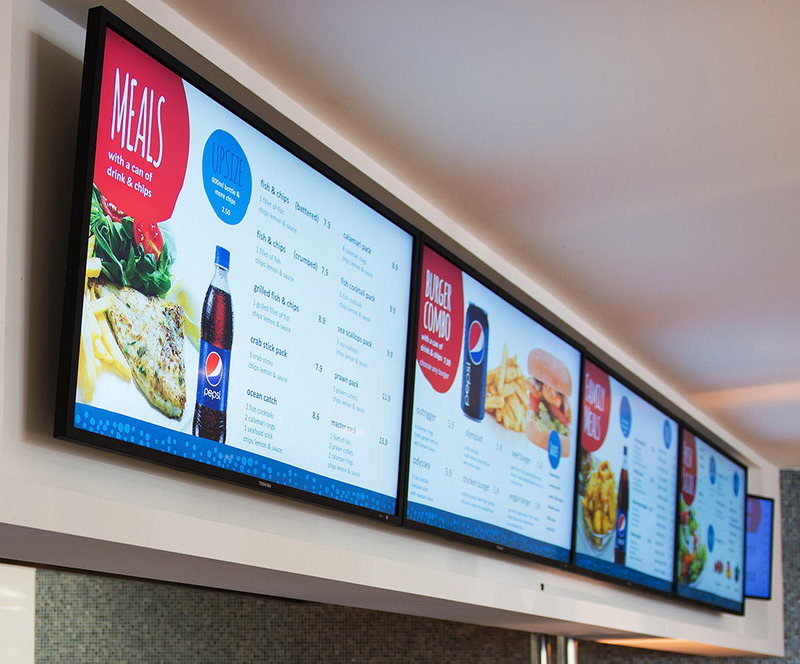 Cost Savings From Updates – A Digital Signage system, unlike a printed menu board or advertisement, does not require a high cost to change. When an additional item or service is added to a menu, for example, the normal way to add this on the physical menu board is through having a brand new one created. With Digital Signage, all that is needed is a quick change in the content that is being displayed. This change can then be pushed to every Digital Signage player on the network. The cost savings over the lifetime of the Digital Signage System far outweighs the upfront cost of said system. If you are interested in putting a Digital Signage system to work for you, please contact us about this. We are more than happy to help with any of your Digital Signage needs. Thank you, and make it a great day!